The following guidelines are to be followed, in spirit, when performing inspections of a constructed fence and in regards to homeowner complaints. Should the Management Company require further clarification or interpretations of these guidelines, the Board shall be consulted and, given the proper leeway by the Restrictions, will have the final say. Not have any gaps in the fence where boards or section(s) of the fence are missing. Not have any broken or split boards. Not have any boards with significant rot. Be composed of all the same type of board and must be consistent with the approved materials for the neighborhood. Be of sound construction so as to not be a hazard to anyone near the fence. Not have warped or bent boards, where the board cannot generally be warped more than the depth of the board (or greater). Not have a non-working or non-closing gate. Not have variation in picket width on the same side. However, transitions in width are allowed among different homeowner's fences, but a single homeowner cannot have varying width pickets, except where different fence standards require or allow otherwise. Fences facing the street must have the smooth side out (no visible railing or posts). Not have pickets repaired by attaching (parts of) other pickets to them. Be of the same type and color as the Lakeline fence at the time of staining, unless otherwise approved by the Modifications Committee. Clear stains (or sealants) are allowed without a modification request. 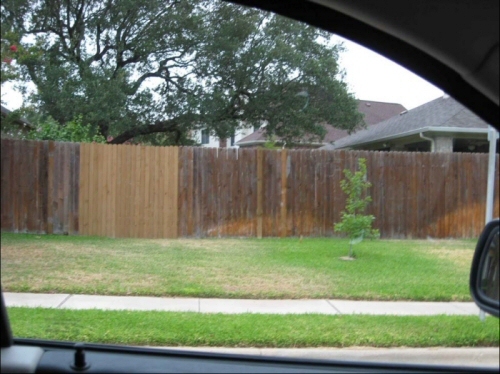 Not have any variations in stain composition or color, except where different fence standards require or allow otherwise. Not have any boards which are not stained. Not have any boards with washed-out or faded stain to an extent where the stain is no longer seen (see appendix A for examples of stain violations). Below are example images of fences no longer in compliance with the spirit of above mentioned policies. Example 1: Sprinkler Pattern has completely removed stain from bottom half of pickets. Example 2: Boards warped beyond acceptable standards. 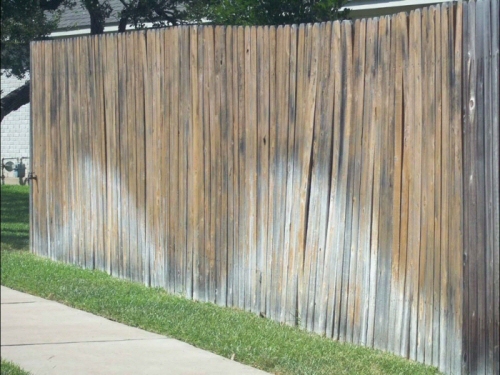 Example 3: Violations include washed-out stain, warped pickets, and a leaning section of fence. Example 4: Washed-out stain and new pickets without stain.